I visited a very special place in Thailand. 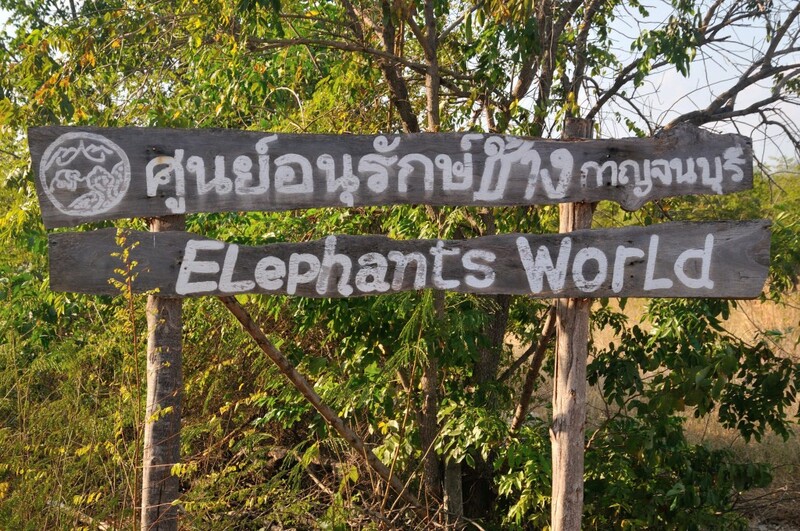 It is called Elephant’s World and was started in 2008 by a man called Dr. Samart Prasitphol. He is a veterinarian and livestock officer of the Kanchanaburi Province. He wanted to start a safe place for unwanted or old elephants who used to work for a living – he is helped to run Elephant’s World by donations and volunteers. Nine elephants live here and they love to play in the Kwai River. Shane told me that there is a movie called “Bridge Over the River Kwai”. The Asian Elephant is much smaller than the African Elephant I saw in Kenya – and their ears are much smaller too! 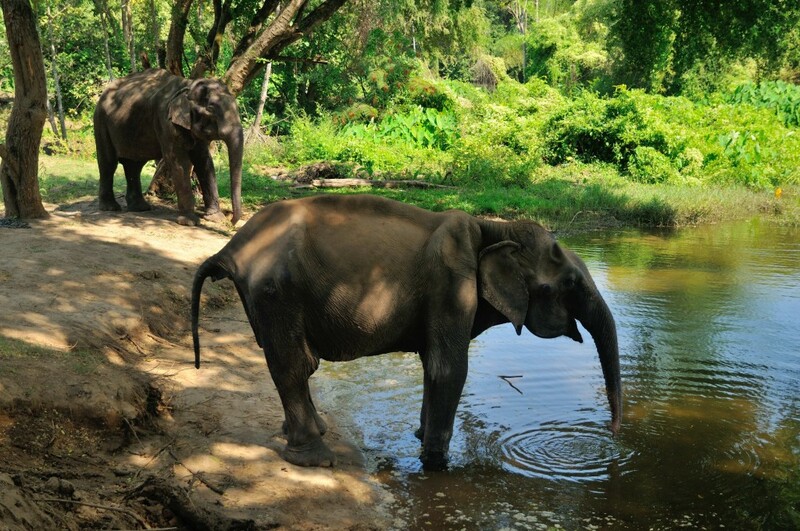 The people who take care of the elephant’s are called a mahout and after drinking and playing in the river the mahouts rode the elephant’s out of the river. We were told that elephants can only carry 100 kilograms (220 pounds) on its back, but can hold more than 500 kilograms (1100 pounds) on its neck, which is why mahouts sit on an elephant’s neck. This means that elephant rides where people ride on a elephant’s back is not good for the elephant. Because visitors work for the elephants, we had to prepare food for them called Sticky Rice Balls. 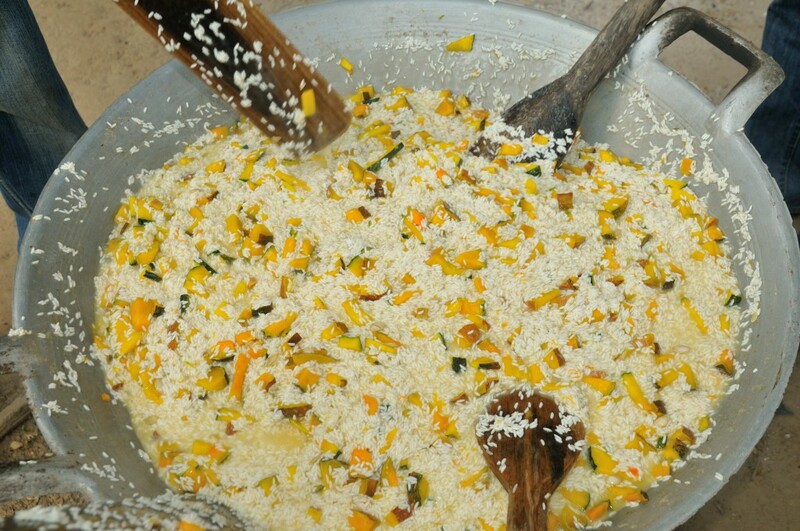 We mixed sticky rice, pumpkin and vitamins together and it was hard work! 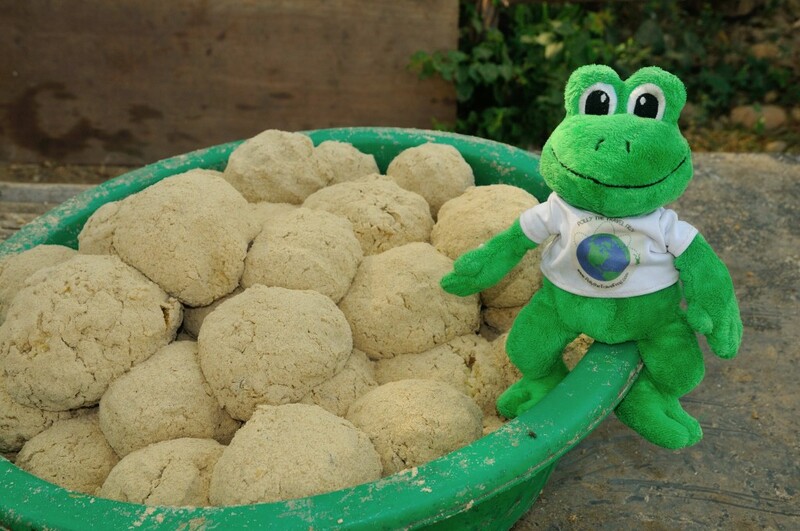 After a lot of time, we rolled the mixture into balls for the elephants who are old and have no teeth to chew. Their mouths are so big that they swallow these balls! 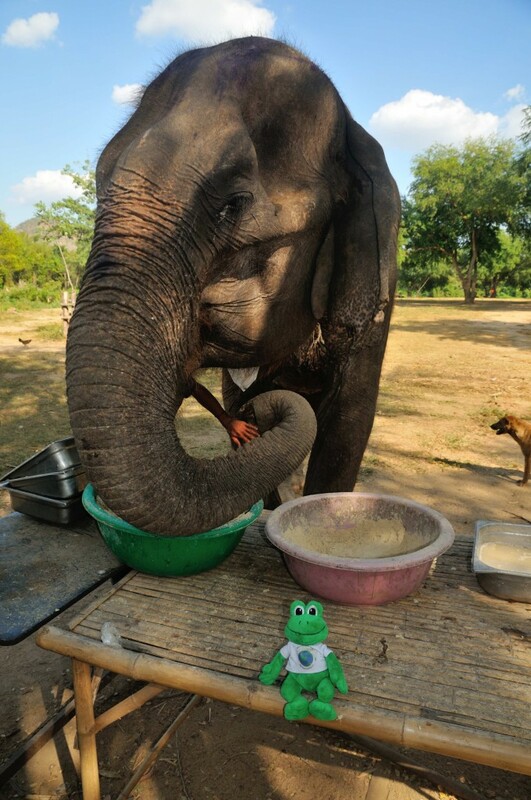 We fed the old elephants and they enjoyed the Sticky Rice Balls very much! I felt safe sitting next to them because they don’t eat frogs. Did you know that elephants can eat up to 10% of their body weight each day? Elephant eating a Sticky Rice Ball and not me! The elephants are also looked after if they are sick. Sometimes they hurt themselves when they hit and bump trees, so staff at Elephant’s World take care of them. 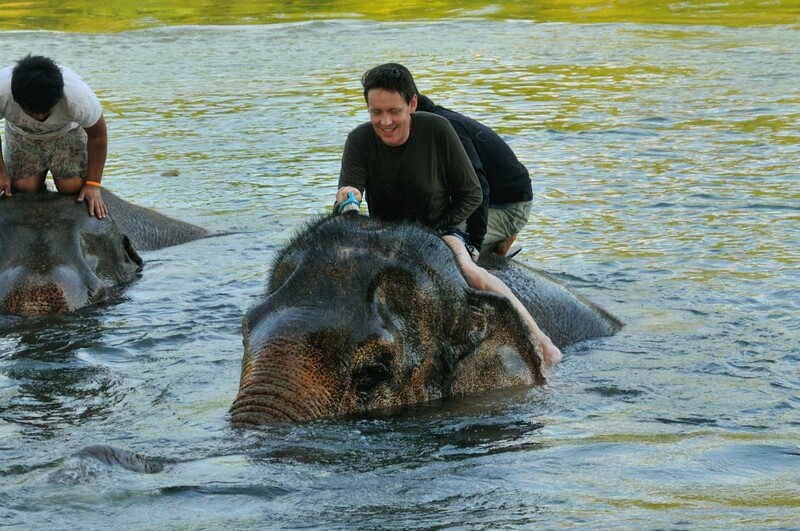 After this was finished, Shane rode on an elephant called Kammoon into the Kwai River to wash and scrub it. But the elephant moved so much that Shane fell into the river! Shane did not think it was very funny when he fell in, but I did! Shane was laughing by the time he swam out of the river, so it was good to see him happy again. African Elephants are too dangerous to ride so it is only in Asia that a person or frog can ride an elephant. Shane washing and scrubbing Kammoon in the Kwai River - before he fell off. After a busy day, the elephant’s are taken to the jungle to sleep. 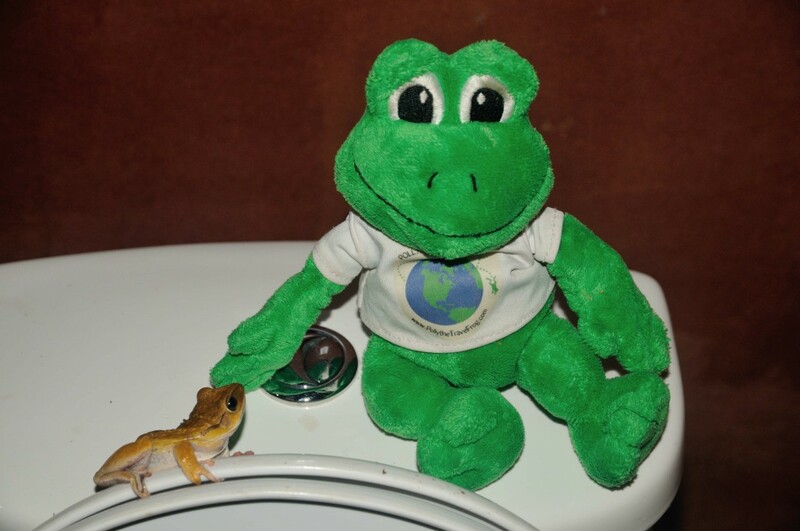 Shane and I were tired after a long day, and when we finished dinner, we were getting ready to sleep when I saw a frog in the bathroom! I was very excited, so we had some froggy talk which is a special language all frogs know. I was very happy to meet this cute brown frog. 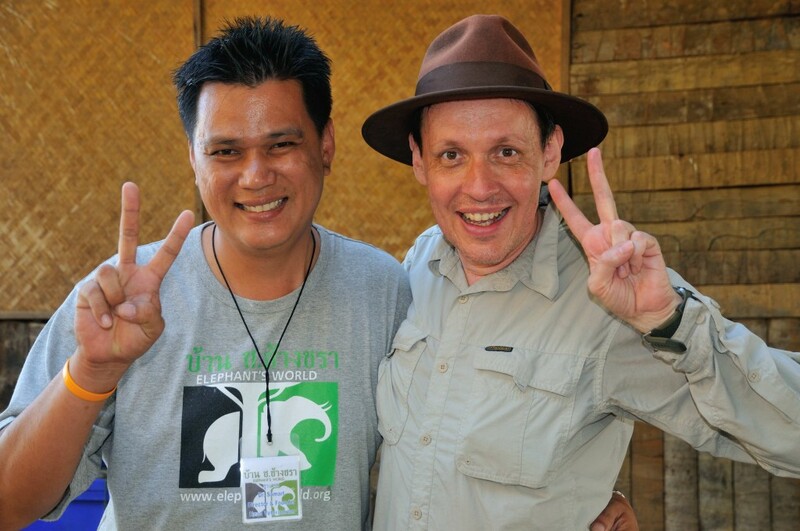 The next day we were met the founder of Elephant’s World, Dr. Samart Prasitphol. I think he is a very kind man because he loves his elephants so much. 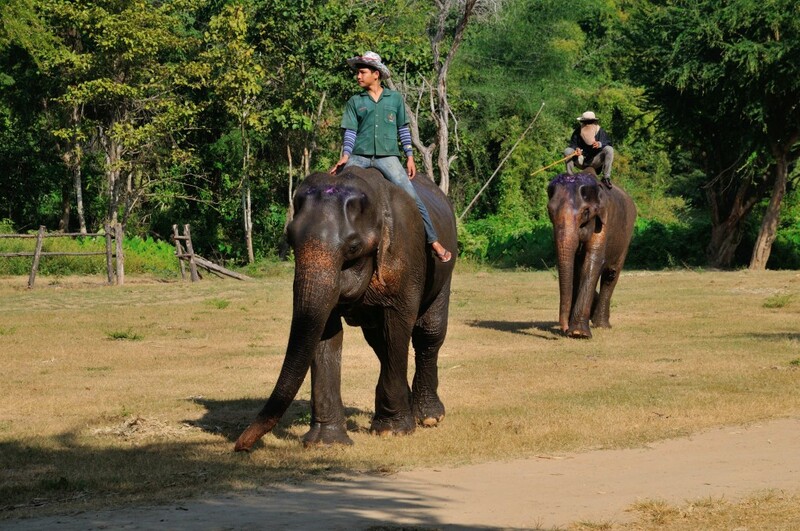 I was sad to leave Elephant’s World – there were many beautiful elephants and it was fun to care for them. If people visit Thailand, they should visit Elephant’s World so that they can care, feed and wash the elephant’s for themselves! I absolutely love elephants, and I must admit that I am very jealous of your adventure. It looks like you had a wonderful time and your pictures are fantastic! I also liked learning about the sticky rice balls that are fed to the older elephants. This will be an adventure that you’ll never forget! Thanks so much for posting this story! I do all of my own writing. The person who bought me can’t spell or punctuate worth a hoot! Thanks so much for visiting my site! I visited your travel blog and tried to leave you a message, but for some reason the comment field didn’t work. 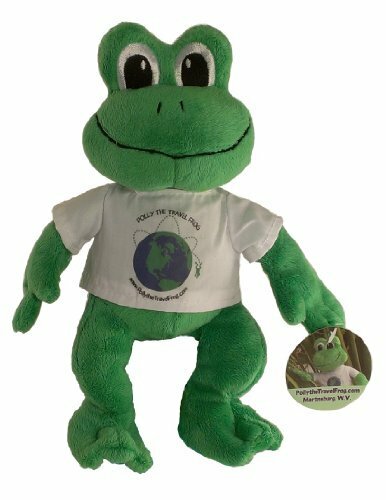 Shane’s Polly posts are fabulous and we’re so lucky that he’s part of the Polly the Travel Frog family! Polly #5…I thought your owner has a degree in English. Maybe he just bought the diploma! LOL! Polly #7 must be the most traveled frog on the planet, I really enjoyed the elephant post. Great story…how did you find out about Elephant World? Shane told me that he found out about Elephant’s World by searching on the Internet before we visited Kanchanaburi. I’ve always been fascinated by elephants and loved all the pictures! Also, I’m really glad that elephants don’t eat frogs! I love how you travel to different places! Have you ever been to Paris? Valuable information. Lucky me I found your web site by accident, and I am stunned why this accident did not came about in advance! I bookmarked it.